I love prawns! Not only because they're tasty, but also because they are so easy to and quick to cook. A few minutes is all it takes! Lehsuni Jhinga is a tangy, tasty dish that can be served as a main with a salad or as a side dish to a more elaborate meal. I also like to serve it as an appetizer, especially at get together where they're only going to be a whole heap of substantial snacks. Since they are made on skewers, they are easy to hold while eating, so no crockery or cutlery is required either! Perfect eh?! Another way to use Lehsuni Jhinga is to cook it and then remove the prawns from the skewers while still warm and toss through a green salad. I have also made a portion into wraps (filled with a green salad in Chapatis) for my kids. It's so yummy! The secret to perfect Lehsuni Jhinga is to marinate the prawns well and for the right amount of time. Remember to factor marinating time into your prep. I like to marinate ahead of time since cooking hardly takes a few minutes once this step is sorted. Ok, let's get to it! Put the prawns into a large, non-metallic mixing bowl and add the lemon/ lime juice and half the garlic paste. Mix well and coat the prawns. Cling wrap the bowl and keep aside in the refrigerator to marinate for at least 2 hours. In another bowl, mix the remaining garlic, yogurt, garam masala powder, red chili powder, finely chopped fresh coriander and salt to taste. Mix well to blend all ingredients. Pour this mix over the marinated prawns and gently mix again to coat prawns well. Keep aside for an hour. While the prawns are marinating soak bamboo skewers in water (this prevents them from burning up on the barbecue!). When marinated, thread the prawns onto these skewers. Grill on medium heat on a grill or barbecue, occasionally brushing with melted butter (you can also use ghee for this). 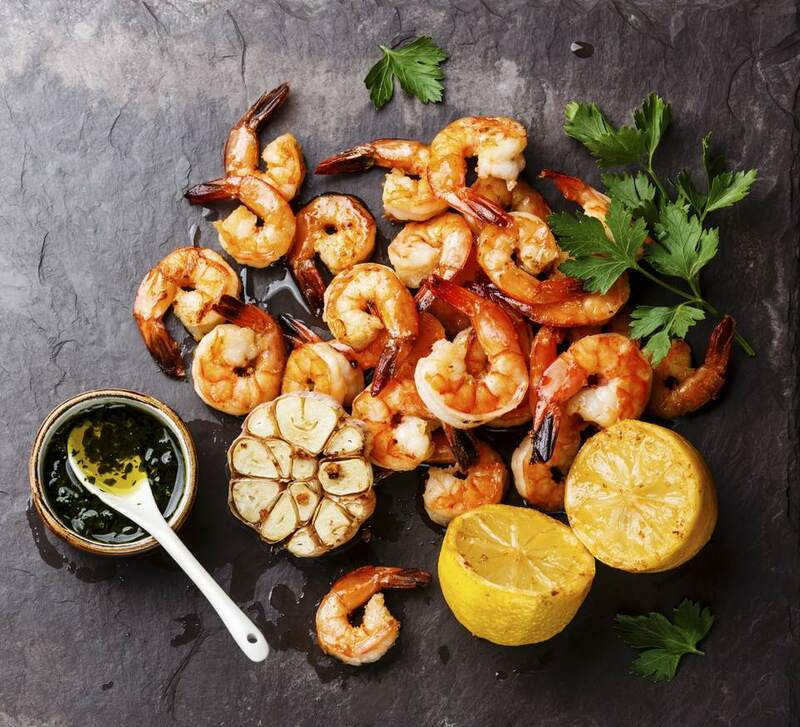 When the prawns are cooked (this should not take marathon a few minutes per side), remove from grill/ barbecue, arrange on a plate and garnish with lemon wedges. Serve piping hot.